Glamorous, well cut, quietly elegant. I love the bodice, very tailored and flattering in a classy way. The dress is made of a crisp fabric which requires ironing to look its best, and is partly lined (in the bodice). The waistline is slightly higher than normal, which is great for me with my rather short upper body. The same-fabric belt finishes the design very nicely with the simple accent of two (working) buttons, but don't be afraid to try a different belt for a change. I found Acevog pretty reliable with their sizes. I normally take a UK size 10 (US size 8, EU 38). When they asked me to try out and review this dress, I found that my measurements are between S and M, so asked for Medium. It fits me perfectly although, for my body type, the skirt is a tad too long. For the price I find it amazingly well made, the long zip at the back runs smoothly and all stitching and details are neat and careful. The full, pleated skirt swings as you walk, which contributes to the retro feel. All the colours offered are beautiful so, for a change, I got the green one, a beautiful emerald shade. Also available in Royal Blue, Wine Red and a rather dull and boring Black. If you like the look of the dress in the photos, I think you will not be disappointed. An original design for this feather-light jump suit. It's constructed as a pair of shorts joined by a lace midriff to a plunge-neck top with adjustable halter-type straps; a flimsy, sheer fabric has been added over the shorts, forming trousers with high slits in the front. The length is generous, probably to allow for high heels. 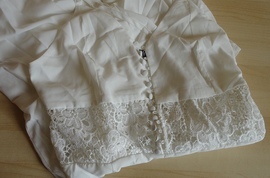 It closes by means of a long zipper on the left side and eleven fabric-covered buttons and loops in front. The fabric is described as a cotton blend; it feels like it has a fair amount of synthetic in the mix, giving it a bit of stretch. It is fairly well put together with clean stitching, no loose threads or visible imperfections (see detailed photos where the colour shows at its truest: a creamy off-white). I could see it in a darker shade, like midnight blue but, for now, this is the only colour choice. I was offered this jumpsuit for evaluation and I really wasn't sure what to expect. Considering the small cost and being realistic, the cut and sheer material make this a frivolous, fun outfit, perhaps not the best choice for a first meeting with the future in-laws. Wherever you wear it, it's guaranteed to attract attention. It looks sensational and very eye-catching on the right figure but would probably adapt to a variety of shapes. I would advise ordering with the correct hip size in mind, so that the shorts fit without too much stress. They do stretch but look better if they are not creased. For reference, in my photos the jumpsuit is being shown in a size Large by a 5'8" UK size 10 (US size 8, EU size 38). I could see this outfit being worn at night at a tropical resort for drinks round the pool, or any time the wearer wishes to make a spectacular entrance. If worn in public, the choice of underwear might need a little thought. It is actually quite comfortable to wear (provided the shorts are the correct size) and feels quite fancy, despite the very low price. It would also work well for a romantic evening at home, as I think most guys would agree. This is a very striking long, flowing dress made of very sheer, unlined chiffon. The fabric features a strong, vibrantly-coloured print of oversized tropical flowers and foliage in three colourways. I chose the Blue for my evaluation, but there are other colour combinations. The fabric is very see-through (look at the sleeve in the photos) and unlined. I actually think this is an advantage: I once had a chiffon party dress with a similarly bold, flowery print, only knee-length. The dress was fully lined with a shorter slip in black taffeta, leaving the sleeves and part of the hem to show skin. It was beautiful and I wore it a few times on holidays for dinner and dancing. Unfortunately, the taffeta lining was so flimsy, it was soon in shreds and, because it was sawn together with the chiffon fabric, I had to throw the whole dress away. This dress gives me the option to wear it as is over a bikini for a beach party, or over a slip or bodysuit for a more formal occasion. The design is very pretty and feminine: very full, flowing skirt, puffy sleeves anchored by a narrow cuff with two buttons, elasticated waist and a super-long, sash-type belt, designed to wrap twice around the waist. That's the good part. This dramatic dress has a few design problems which, depending on your physique, may require modification. I must stress that I received the wrong size, by mistake, so my observations might have been different had I been sent the size Medium I asked for. Instead I have a size XL, so I can only comment on that basis. The length should have been good for me (I'm 5.8” or 1.73 m), however, the hem has been cut unevenly and is longer on the left and back side and shorter on the right and front side. While an oblique hem adds interest to a shorter dress, it does nothing for this length. The only way this 8” difference would make sense is if the dress were shorter in front (showing more shoe) and longer at the back. The waistline is also just about right for me, however, the belt has been attached way too high, barely under the armpit and it is so heavy that it pulls down uncomfortably on the left sleeve. The sleeves are a bit too long for me and the cuff is too wide (as I would expect with a dress two sizes too big), however, the armhole is not as wide as you would expect so I wonder how it would fit someone proportionally bigger than me. 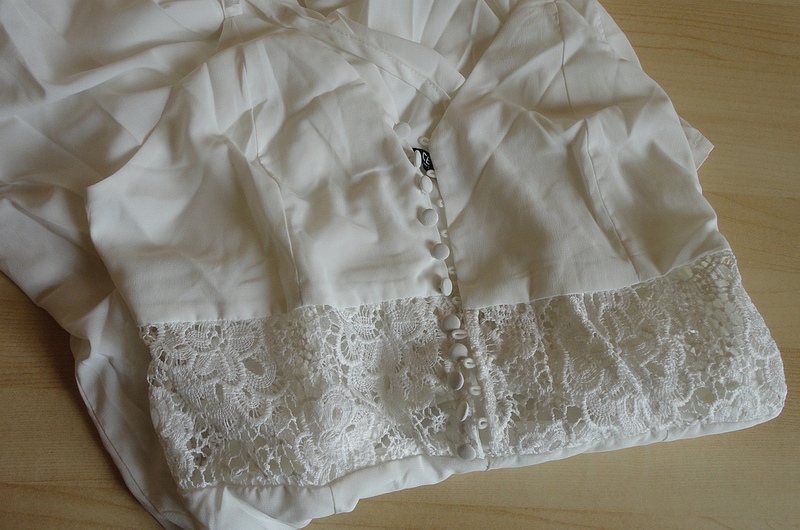 The bodice is massively too large for me, although it is designed to be a snug fit. Since it is left open with only a small overlap at waist level, it requires a button or two or a much bigger overlap to avoid gapping open. Fine over a swimsuit but does not work if you are wearing a bra (for the photos I have used a brooch to close it). Since it is so dramatically large, I wonder how much smaller it would be in my correct size, or whether the many complaints are justified that only a very big-chested figure would fill this top. I can try and make the few adjustments necessary to make this dress wearable, however, the point is that the cut and design could be so much better. I was offered this dress for evaluation with a request for an honest, unbiased review, which is what I have done. However, the manufacturer has also indicated an openness to criticism, so I have passed along my suggestions to them, in hopes that they will revisit the design and apply some basic modifications which would make this potentially lovely dress as good as it looks in the pictures. At this price, one does not expect a perfect custom fit, however, the basic proportions of the average female shape should be observed. I am confident that this dress will soon be available in a much improved form. A pretty pair of shoes featuring an unusual textured surface. The man-made material is criss-crossed in a diamond pattern which catches the light and makes the shoes shimmer. Of the three colours available (black, gold and silver), I selected black. Because of the shiny appearance, they are probably best suited to an evening occasion or festive event, but I believe in wearing what you want where you want, so it's up to you. 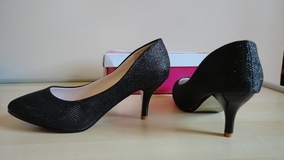 The shape is a classic pump with a slightly rolled sole which actually works well for walking. The heel is quite low and very comfortable even if you are not used to high-heeled shoes, but the tapering stiletto shape makes them look quite elegant. The sole is ribbed and somewhat slip-resistant. I haven't tried them in the rain but they don't seem slippery to walk in. Buying shoes without trying them on is always a bit chancey, but these are so inexpensive that you might decide that they are worth the gamble. I got a UK size 6 (US size 8), which unfortunately is the largest size available. I used to take that size until a few years ago, then I started wearing Crocs and flat shoes and my feet now are more comfortable in a shoe size bigger. 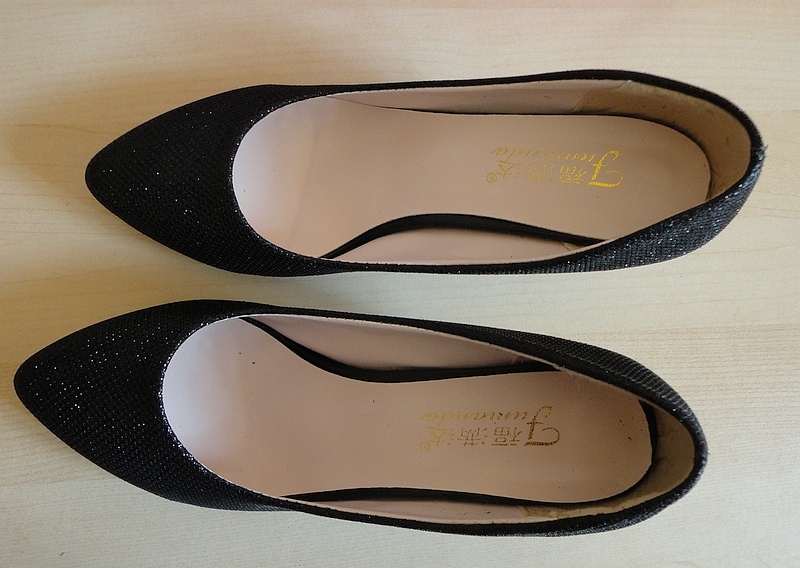 However, these shoes have a medium-width shape and I can get them on, although I would need a size 7 (9) to remain comfortable if I had to wear them all day. So, if you have dainty, small feet up to a UK size 6 (US size 8), they should work for you. The fit is not tight, but they are on the short side. Because of the open vamp, they work well for most shapes of feet, even those with high arches like mine.